Is Crying After a Formula Change Normal? If your baby starts acting fussier than usual after you change his formula, it's natural to look to the formula as the cause. Infant formulas, while similar in their nutritional value, can differ significantly in composition. It's possible that your baby may tolerate one brand and not another, especially if you switch formula types. Formulas based on cow's milk or soybeans, hydrolyzed formulas that are easier to digest, special formulas for low-birth-weight babies and lactose-free formulas all sit next to each other on the supermarket shelves and may appear interchangeable, but your baby may not tolerate all of them. If you changed formula because your baby suddenly started fussing and crying more often and the baby is around 3 weeks old, the formula may not be the culprit. Babies who are destined to be colicky start to develop it around this age, and colic often worsens over the next few weeks, peaking at 6 to 8 weeks and disappearing by 3 to 4 months, regardless of formula type. If your baby is older than 4 months or has an increase in gastrointestinal symptoms such as spitting up, vomiting, gas, bloating or diarrhea, it's more likely that the formula could be to blame. If you changed from cow's milk formula to soy because your baby didn't tolerate the cow's milk-based formula, soy formula may not solve the problem. Between 20 and 50 percent of babies who have trouble with cow's milk-based formulas also have trouble with soy-based formulas, according to the Australasian Society of Clinical Immunology and Allergy. Around 10 percent of babies with a cow's milk allergy need an amino-acid-based formula. Lactose-free formulas are rarely necessary in infants because lactose intolerance, an inability to digest the milk sugar lactose, normally doesn't develop until after age 2 or 3, PubMed Health explains. If you've only changed brands and not formula types, the difference could still upset your baby's digestive tract. Formula manufacturers all use slightly different ingredients to make their formulas "unique" and give them a selling point to stand out from the crowd. Manufacturers can vary the types and percentages of fats, proteins and carbohydrates they use to make their formulas. Some, for example, use a higher percentage of whey, a more easily digested protein, to casein, which forms a harder, less digestible curd in the stomach. The only way to know if the formula change is the cause of increased crying is to change back to the original formula. If the original formula was causing problems, then try a new brand or type, if your doctor agrees. Don't change formula types without talking to your baby's doctor first, since some formulas aren't suitable for all babies. Premature babies, for example, may need formulas with more digestible fats and a higher calorie-per-ounce level. 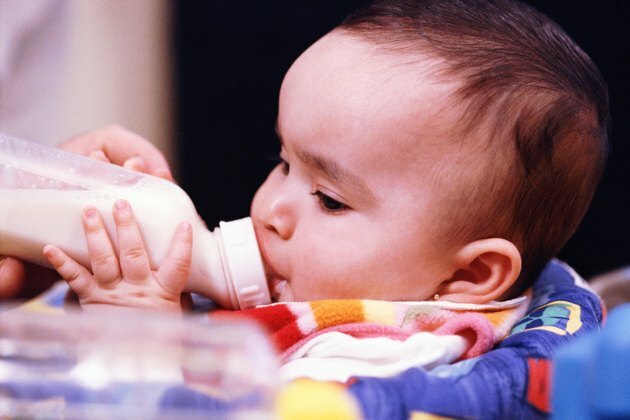 Hypoallergenic formulas can cost around three times as much as cow's milk formulas, registered dietitian Gloria Tsang reports, and there's no point in paying extra for a formula that your baby doesn't need. Can Babies Get Diarrhea from Switching Brands of Formula?